The history of the trophy, printed on good quality card with rounded corners and a decorative blue and pink border and made to fit into the original box. 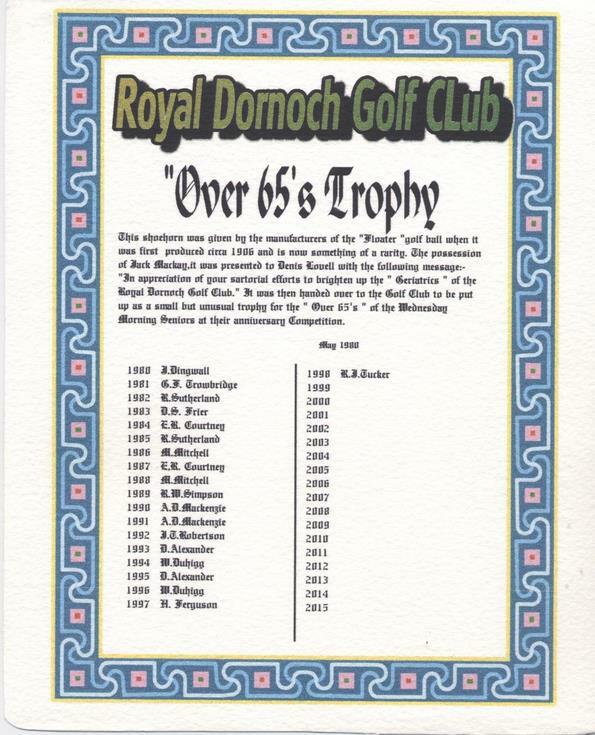 It is headed "Royal Dornoch Golf Club Over 65's Trophy" and explains that the shoehorn was given away as a promotional item by the manufacturers of the Floater golf ball in 1906. It belonged to Jack Mackay, who gave it to Denis Lovell "in appreciation of your sartorial efforts to brighten up the 'Geriatrics' of the Royal Dornoch Golf Club". It was then given as a trophy at the anniversary competition of the over 65s of the Wednesday Morning Seniors. It lists the winners from 1980 to 1998.